For decades, deer hunters across the nation have known the sinking feeling that comes when a visit to the deer woods doesn't go as planned. Meaning no antlers for the wall, and worse yet, no succulent venison for the freezer. But this fall, as the height of Deer Season kicks in across the country, hunters with an empty pick-up truck and an unused deer tag are still in luck, no longer destined to come up with a palatable recipe for tag soup. That's because nationwide chain-restaurant Arby's is getting ready to unveil the company's new sandwich, a venison steak offering that seems likely to be a crowd pleaser if a sampling of several Outdoor Channel hunting show hosts is any indication. "A venison sandwich?," said Tiffany Lakosky, co-host of Crush TV with Lee & Tiffany along with being one of Outdoor Channel's leading authorities on cooking venison. "No way! I had not heard that (yet), but it sounds yummy." "I like it a lot!," said THIRTEEN co-host and Midwestern deer hunting guru Mark Drury when I asked what he thought of this week's news. "God bless them!" "I had not heard that," added Jim Ronquest, executive producer of RNT-V on Outdoor Channel's sister network, the Sportsman Channel. While Ronquest's specialty is figuring out how to cook ducks taken in flooded timber each fall, his home state of Arkansas is a deer hunter's paradise where eating venison is a way of life. Because of that, he really isn't surprised by this news. "For those of us who live and love the outdoors lifestyle, the woods and waters of this great country is our meat market and grocery store," quipped Ronquest, the 2006 world duck calling champion. Editor’s Note: This is one of several new Arby’s commercials, custom tailored for outdoorsmen. Ralph Cianciarulo, who co-hosts Archer's Choice and The Choice programs on Outdoor Channel with his wife, Vicki, was equally enthusiastic. "Arby's is coming out with a venison sandwich?" said Ralph. "That's awesome for sure! We all need to support them on that." The guess here is such enthusiastic reactions are exactly what Arby's is hoping to obtain in the 17 restaurants across six states (Georgia, Michigan, Minnesota, Pennsylvania, Tennessee and Wisconsin) that will offer the venison-steak sandwiches from late October through late November this year. "Hunters hunt the meats, and we have the meats, so it makes sense for us to connect with them and offer a sandwich that they can’t get at any other restaurant chain,” said Rob Lynch, Chief Marketing Officer and Brand President of Arby’s Restaurant Group, Inc., in a company news release. “We’re a brand that’s not afraid to take risks and while the venison sandwich is probably the biggest stretch for us yet, it’s incredibly delicious and we can’t wait to get it in the hands of our guests," he added. "You won’t leave a hunt empty-handed after stopping by Arby’s." From a look at the photos that Arby's has supplied along with their news release, that would certainly appear to be the case. According to the national chain, the new Venison Sandwich at Arby’s will come with a thick cut of venison steak marinated and slow cooked for three hours. On top of that venison steak, hunters will find a pile of crispy onions sitting on a toasted specialty roll. Add in a Cabernet steak sauce featuring juniper berries among other things and you've got the makings of an incredible wild-meats treat while going through the drive-through lane after a long and tiring hunt. 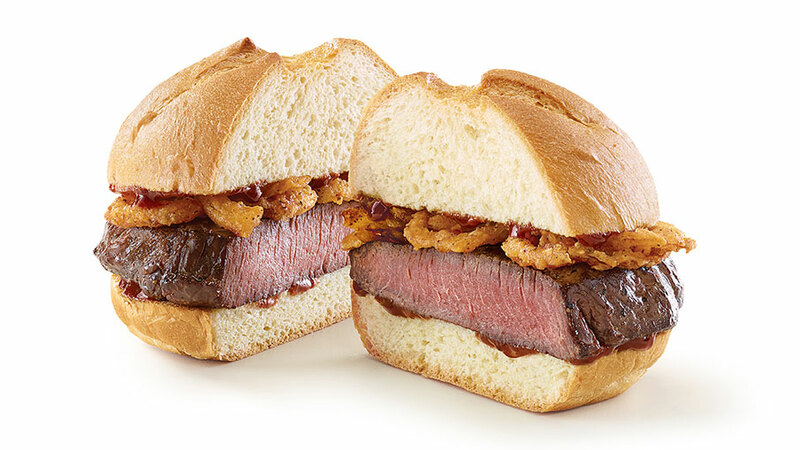 What do other hunting gurus on Outdoor Channel think about the new Arby's Venison Sandwich? "We can only pray and hope that people will accept it really well," said David Holder of Raised Hunting, who along with his wife, Karin, were literally heading out the door to go deer hunting when I contacted them about this story. "I think it also helps indicate that hunting is here to stay," David added. "It's not just a sport or a pastime, it's a way of life for so many of us and it looks like they are recognizing that." Karin also adds that many people across the country are becoming more and more conscious of what they are putting into their bodies, opting for more natural foods and cooking processes. "You know, there's a big push with a lot of people to eat more naturally, from organic foods to the kind of things that you'd find on the Paleo Diet," she said. "And this, to me at least, seems to be another step in that direction where people are watching what they consume more so than in the past. "And what better meat is there to eat than venison?," she adds. Ralph Cianciarulo, ever the jokester, wondered aloud if there might be another way that the restaurant chain can help deer hunters out this fall. "Can we drop off our bucks (to be processed) so we can eat healthy?" he laughed. "Fresh venison baby!" Of course, Ralph is more than willing to accept the more traditional sandwich if necessary. "Venison on the fly at Arby's, no matter if you fill your tag or not," he quipped. Michael Hunsucker, co-host of the popular Outdoor Channel show Heartland Bowhunters, is another hunting personality impressed by the news. "I think it's awesome that more people are becoming aware of the food that they put in their bodies," said Hunsucker. "It can only help people understand one of the main reasons why we hunt." This news seems like a win-win kind of a deal for hunters coming out of the deer woods on a dark and chilly evening this fall. Because if those hunters were successful, it's time to head home and prepare some of the leanest, best meat to be found anywhere in the world, a fresh supply of venison steaks and backstraps. And if those deer hunters weren't successful? Then all they have to do is look for an Arby's highway sign lighting up the sky at the next exit. Because for a few weeks at least, a tasty venison steak sandwich is waiting for a hungry hunter willing to take just a few moments to pull through the drive-through line.